This is a hard review to write. This book has a really important and surprising twist that I cannot tell you about as it would ruin the novel, absolutely ruin it. This therefore means that there is a lot I cannot talk about in this review, but I’m going to do my best to give you a spoiler-free review for this awesome book, which means this is probably shorter than a lot of my reviews, but trust me you don’t want spoilers!I heard about What’s Up With Jody Barton? on twitter, where the lovely Lacey (who works for Macmillan in publicity) told a lot of us bloggers about it and I cheekily asked if I could have a copy to review as it sounded great. When it arrived in the post, I instantly started it and in fact had finished it within one sitting.What’s Up With Jody Barton? tells the story of Jody, twin to Jolene, who is put in that awkward position of liking your sister’s boyfriend. I adored Jody as the character was really well developed, from Jody’s love of RIver Phoenix and Jim Morrison to Jody’s math geek status. As a teenager, I was a little in love with River Phoenix and obsessively watched Stand By Me, Running On Empty and My Private Idaho a zillion times, no exaggeration. I even remember being terrified of injections and my best friend sitting with me for a jab and talking to me about River Phoenix. Then the horrid person with the needle said, isn’t he dead? and then stuck a needle in my arm. Not cool, not cool at all. Diversions aside, I’m sure you can see I really liked Jody and enjoyed reading about the character – because, let’s face it if you listen to The Doors and like River Phoenix then there is no denying your awesomeness.What’s Up With Jody Barton? 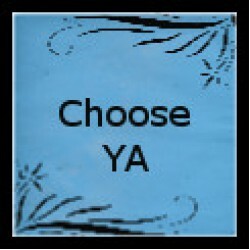 deals with identity and being a teenager really well, along with some other very timely and important themes for teens. 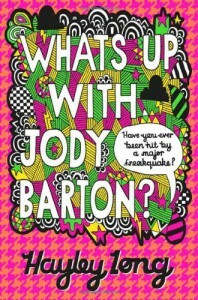 I think this book is a definite must read as the plot twist is so skilfully written and hinted at throughout the novel, the characters feel very real and the Barton family is brilliantly written, especially the twins’ dad.What’s Up With Jody Barton is published by Macmillan and available to buy now. I received my copy for free in exchange for my honest review from the publicist.This review was originally posted at www.chooseya.com on May 30th 2012.